Add a burst of color to your garden. For the most part, their basic care is the same. Whichever variety you select, you will find that most can be grown from zones four through nine. Just be sure that the temperatures in your zone are reaching 70 to 85 degrees when you plant your flowers. Most geranium failure is due to planting too early in the season. Proper care for geranium plants includes providing full sun from six to eight hours a day. They prefer moist, well drained soil, and you'll need to allow them to dry out between watering or the roots can rot. Fertilizing regularly is also an important part of geranium care. Monthly feeding with a 10-10-10 fertilizer will keep them happy. You can also use a water-soluble fertilizer about every third watering. Avoid selecting plants that have long, leggy stems or brown roots. Find a healthy, green plant with buds to bring home. Geraniums should be planted level with the surrounding soil in dirt that has been mixed with peat moss or compost. More organic material should be added each year. Be sure your geraniums are spaced far enough apart to accommodate their full growth. Over-crowded plants are prone to disease. Once in the ground, firm the soil and water thoroughly. Water should be at the root of the plants, not over the top. Mulch should also be used to help keep roots cool and to help keep soil moist. While they are pretty hardy plants, sometimes geraniums are susceptible to fungal diseases. One such disease is called bacterial leaf spot which is caused by the Xanthomonas bacteria. Typically this disease is caused by warm, wet, crowded planting areas. If you see pinhead-sized, sunken, brown spots remove and destroy the leaves affected. For severe infections you will need to remove and destroy the entire plant. Botrysis leaf spot and blossom blight are other fungal diseases that you may discover in your geraniums. Caused by the Botrytis cinerea fungus, this disease is found in cool, moist conditions. Affected leaves form brown areas that develop grayish-brown spores. Affected flowers have discolored petals that fall from the plant. Remove affected parts of the plant and spray with Daconil or a similar product. There are other problems that you might encounter with your geraniums. Usually though, they have simple solutions. Plants that don't seem to bloom after being brought home usually require more light. Remember, proper care for geranium plants includes six to eight hours of full sun each day.If the lower leaves of your plant are turning yellow, this could be an indication of too much water. Don't forget to allow soil time to dry out between watering. Working organic matter into the soil can help improve drainage. Yellow leaves over the whole plant can mean that you plant needs fertilizer. Usually by this point, the geranium has been in need for some time. Expect a few weeks to see improvement after providing fertilizer. Small holes in the flower buds are caused by budworms. These can be hand picked. Pesticides can also be used such as Sevin or Orthene, but these should be used with caution, as should any chemical. 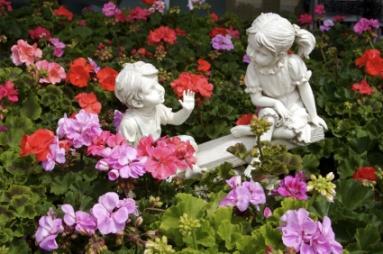 Once you understand the basic care of geraniums, you will find that they are easy to grow and enjoyable to have around you home and landscape. Try some different varieties like Cranesbill, Rosebud or some of the other scented varieties that have a fragrance like lemon, peppermint, apple or nutmeg. All are sure to brighten your day.